The fertile valley of the Cudgegong River - prime territory of the Wiradjuri people - was settled early in the British colony's expansion into inland New south Wales. The town of Mudgee was surveyed in 1823, just ten years after the Blue Mountains were crossed, and developed rapidly in the gold rush of the 1850s as the second major town west of the mountains (after Bathurst). Gulgong also grew from the gold rush, while Kandos was established in 1913 for another mineral venture - limestone quarrying. The Cudgegong River rises in the mountains of the Great Divide to flow west into the great Murray-Darling system. The highest mountains ringing the head of the valley are volcanic – capped in basalt lava flows some 17 million years old. The most extensive of the high tops is Nullo Mountain, and the loftiest is Mount Coricudgy at 1256 metres - both just outside the national park. But many other lyrically-named peaks crowd the horizon of the Greater Blue Mountains World Heritage Area's Monundilla sector, including Mount Monundilla itself deep in the Wollemi Wilderness, Mount Coriaday, Mount Pomany, Mount Coorongooba and Tayan Pic. Surrounding the basalt peaks is a spectacular landscape of sandstone ravines and ridges and cliffs, dry forests and rainforest gorges, falling into the west into wide basins of agricultural country. It is the more fertile volcanics that have been such a boon to the human history of the region. With a gentle gradient and broad valleys, the Cudgegong River has gathered the basalt-enriched sediments washed down from the mountains into wide and fertile alluvial flats. This was the first place in Australia to grow chardonnay and merlot grapes, and today more than 50 wineries add to the agricultural prosperity of the region and its appeal to visitors. The Mudgee district has the best of several worlds – a magnificent natural setting, productive rural lands, historic towns with many stately buildings from the 1850s and a vibrant cultural and culinary life: something for everyone. The Mudgee district lies across the edge of the geological structure known as the Sydney Basin- a deep pile of sandstone and other sedimentary layers built up over millions of years by huge rivers in the Permian and Triassic eras. Beneath and to the west lie much older, harder and folded 'basement' rocks of the Lachlan Fold Belt. The boundary between these two formations is marked by the sandstone escarpments and clifflines that wind in a very complex way around the Capertee and Cudgegong valleys, in the east of the Mudgee district. Being of more rugged terrain and much less fertile for agriculture, the sandstones of the Sydney Basin were largely left alone as development spread across the landscape. And so it is these areas that were still intact enough to be valuable for conservation, and have gradually been added to the reserve system. The Mudgee district illustrates this divergent land use history very well. The national parks of the Greater Blue Mountains World Heritage Area occupy most of the rugged sandstone country to the east, punctuated by volcanic peaks. Some outlying sandstone areas like the Goulburn River headwaters and Munghorn Gap are also protected in conservation reserves. Meanwhile the valleys and plains of the Lachlan Fold Belt terrain in the west of the district has been largely developed for agriculture. 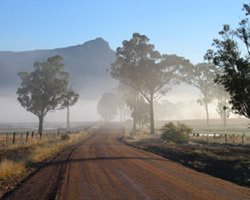 The Cudgegong Valley is particularly blessed, because the already-better soils of the basement rocks have been further enriched by volcanic sediments washed down from the hills.